Earlier this month brought people from all corners of the world for Chicago’s greatly anticipated summer music festival Lollapalooza. The three day music fest featured big and small bands both English and non-English that provided attendees with everything from dance and electronic to indie and rap and much more. Headliners included Outkast, Lorde, Eminem and Kings of Leon. If you were lucky enough, you may have even run into Mexico’s Ximena Sariñana—and no not onstage but instead walking the streets of Chicago and enjoying the various acts. 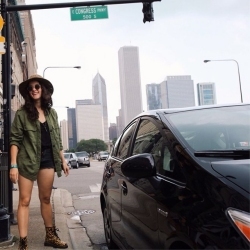 Sariñana will be heading to San Francisco for the “Outside Lands Music Festival.” She hopes to return very soon to the city but this time to play for the Chicago public. Be on the lookout for her upcoming album!